In a medium bowl, stir together pumpkin puree and 1 teaspoon pumpkin pie spice; add ice cream and stir until blended. Cover and freeze until firm, about 3 hours. To make dessert cups, place oven rack in center of oven. Preheat oven to 400ºF. In a small cup, mix sugar with remaining 1/4 teaspoon pumpkin pie spice. Warm tortillas in microwave until pliable, about 10 to 20 seconds. Lightly coat both sides of warmed tortillas with cooking spray. Sprinkle one side of each tortilla with sugar mixture. Place each tortilla, sugar side-up, in a hole of a muffin pan, to form a bowl shape. Bake until tortillas are crisp, light golden and are holding their shape, about 6 to 7 minutes. Remove tortillas from pan; cool on a wire rack. 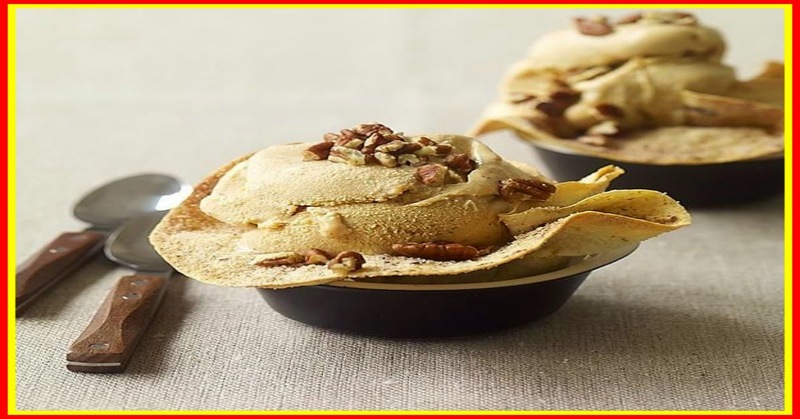 To serve, fill each cooled tortilla cup with 1/2 cup ice cream; sprinkle each with 1 teaspoon chopped pecans. Serve immediately. Yields 1 filled ice cream bowl per serving. This recipe is a great make-ahead holiday dessert. Double or triple the recipe for larger gatherings and just assemble the ice cream in the bowls when it’s time for dessert.